In yesterday’s class of game theory, I learnt one of life’s most important lessons, proven mathematically. It is a generalization of the Shooting Game to life and business, and I’ll try to keep it as non-technical as possible. If you’re not already familiar with the term, game theory is a subset of economics that assesses the behavior of people in situations where the result (outcome) of their actions (strategies) is influenced by the actions of other people (players). The most widely known example of a game is the Prisoner’s Dilemma. “Each player has a pistol loaded with only one bullet. They stand 10 steps apart and walk towards each other, at the same pace, one step at a time. After each step, they can choose to fire their one bullet at the other player. The probability of an accurate shot increases with each step, as the players get closer to the other player. 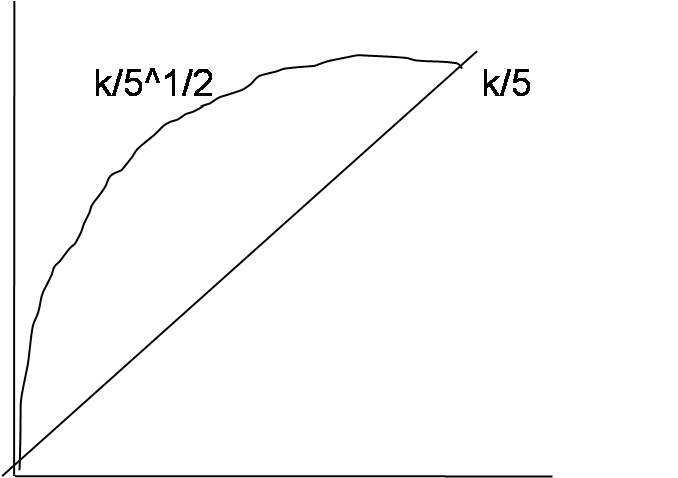 After k steps, it is k/5. So the probability of hitting increases from 0.2 to 1 over 5 steps. Equilibrium outcome: Actual play of the game will result in both players shooting at step 3. The idea is, you must be as accurate as possible, yet still have the chance to take a shot (not die). The game can be generalized to business competition, like the launch of a new product. The more realistic version though, is one in which the skill sets of the 2 players differ. Let’s say the probability of an accurate shot varies with each player. For one, it is k/5, and for the other, square root of k/5. The latter being the weaker player, must always shoot first, reason being, it’s his best option and he has nothing to lose. When skills differ among players, notice that the origin is where the gap in skills is the narrowest. Therefore, it makes most sense for the weaker player to shoot right at the start of the game. The same can be applied to weaker players in real life – weaker in terms of assets, with less at stake in terms of reputation, responsibilities, opportunity costs and the worst case scenarios. For instance if you are right at the bottom, at work or in a race, your best strategy is to take risks and try to change things drastically. In the worst case, you’ll fail and stay at the bottom, losing nothing. In the best case, you’ll rise! If, on the other hand, you’re already leading or are very near the top, it makes sense for you to continue with things that have proven to work and avoid risks, because if you try and fail, you will slip all the way to the bottom. Best case, you’ll remain where you already are! The game was in execution in the last season of the Amazing Race too. The challenge was to find a clue on one of 7 islands. The second team which was right behind the first, followed the first. It was a logical decision, they had everything to lose, being almost at the top. One of the other teams though, consisting of a couple of soccer moms, was far behind. At the bottom already, with not much at stake, they decided to take the off-beat path to an island different from the one taken by the first too. Best case, they’d win. Worst case, they’d stay at the same position. Game theory at its best. And guess what, they won indeed, and managed to stick around longer in the amazing race! Lesson for life: Take risks now, challenge conventions now, experiment now. The older you become, the more responsibilities you take on, the more you have at stake to risk. If you want to do something different, if you want to try something new, the time is now. Go for it! That interesting lesson from a game Shivya. Nice Posting… ! The ‘Lessson of Life’ I have read many times, but never have seen the explanation like this. Just loved it. More intersting it is part of economics, I thought it should be included in class of Psycology. You’ve got a nice blog.. hope to follow it often. that would be amazing lethal500@hotmail.com…..THANKS!! !